HMH Books for Young Readers, 9780544456129, 40pp. Is this poetry? Math? A brainteaser? Yes! It’s all that and more. The poet J. Patrick Lewis has reimagined classic poems—such as Edgar Allan Poe’s “The Raven” and Langston Hughes’s “April Rain Song”—and added a dash of math. Between the silly parodies and the wonderfully wacky art, kids will have so much fun figuring out the puzzles, they won’t guess they’re learning! Answers appear unobtrusively on each page, and engaging information about the original poets is included. 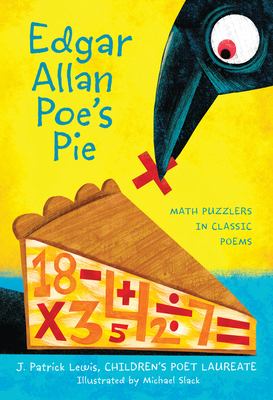 Math games and concepts, poetry and poet biographies—it’s all so cleverly put together. This funny book is a treat for fans of words and numbers alike. J. Patrick Lewis has authored more than fifty books of poetry for children. In 2011, he was named the Children’s Poet Laureate by the Poetry Foundation and was given the NCTE Excellence in Children's Poetry Award. He lives in Westerville, Ohio.Visit his website at www.jpatricklewis.com.